Villa Casa Blanca is located within the gated community of Mammee Bay Estates. Guests are able to enjoy the Mammee Bay private beach which is pristine, away from the crowds and just a short walk along the beach road. Casa Blanca comes with a full staff including a cook who is available to prepare meals for you and a housekeeper. You may wish to luxuriate by the large private pool, walk to the nearby beach or visit the choice of close by attractions including Dunn's River which is just minutes away and Ocho Rios Town less than a ten-minute drive. 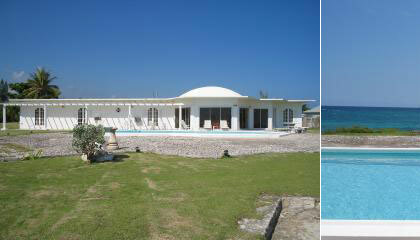 The villa is spacious light and airy benefitting from ocean breezes and breathtaking views. The combination of peace and comfort in an inspiring and exclusive setting promotes a sense of being worlds away from hustle and bustle yet Mammee Bay is centrally located for access to all the activity desired. Each of the five bedrooms has independently controlled air conditioning units as well as ceiling fans. Four of the bedrooms have French doors opening onto verandas facing the ocean. Nights can be spent peacefully listening to calming sea waters. Alternatively, you might opt to take up livelier activity in one of the Ocho Rios entertainment venues -- with Casa Blanca you are able to tak advantage of both worlds!